Crepes are a big deal in our home, especially when they are chocolate. Lathered in a heavy dose of chocolate hazelnut Nutella. Then topped with freshly whipped cream and sliced strawberries. A little-shaved chocolate finishes it off because it is completely normal to eat chocolate for breakfast. 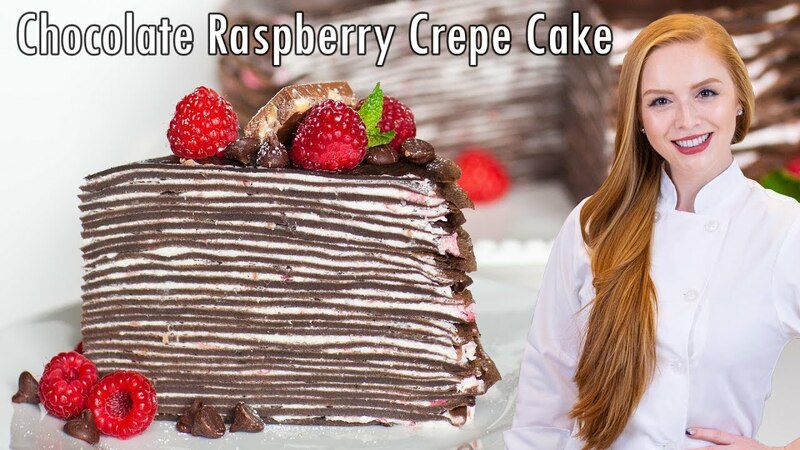 To make this Strawberry Nutella Chocolate Crepe Cake, you start with tender chocolate crepes made with eggs, milk, cocoa powder, flour, sugar, and salt. The crepe batter can even be made in a blender for ease of preparation. It is cooked with a bit of butter in a skillet or crepe pan. The cream is made with soft cream cheese whipped together with heavy cream, which cuts the sweetness of the Nutella. Sliced strawberries are added because there is nothing better with Nutella than strawberries. Ingredients, Eggs, Milk, Cocoa Powder, Sugar, Salt, and Butter. And for Whipped cream you need Softened Cream Cheese, Whipping Cream, Powdered Sugar, Nutella, Sliced Strawberries, Grated Chocolate Bar for garnishing. For Crepes combine eggs, flour, milk, sugar, and salt in a blender and whisk it until it becomes a smooth batter. Preheat a nonstick crepe pan, put a pat of butter in a pan and a half cup of batter and quickly tilt the pan for an even, cook until it is set about 1minute, repeat it with the remaining batter and butter and make more crepes. For Whipping Cream, In a bowl whip cream cheese and a half cup of heavy cream until light and fluffy and set aside, whip remaining heavy cream until soft peak forms. Place one crepe on a platter, and spread with Nutella, filling and strawberry slices, repeat with remaining crepes and filling end with a crepe on top. Spread with Nutella and dollop the cream on top. Cut into wedges and serve immediately.